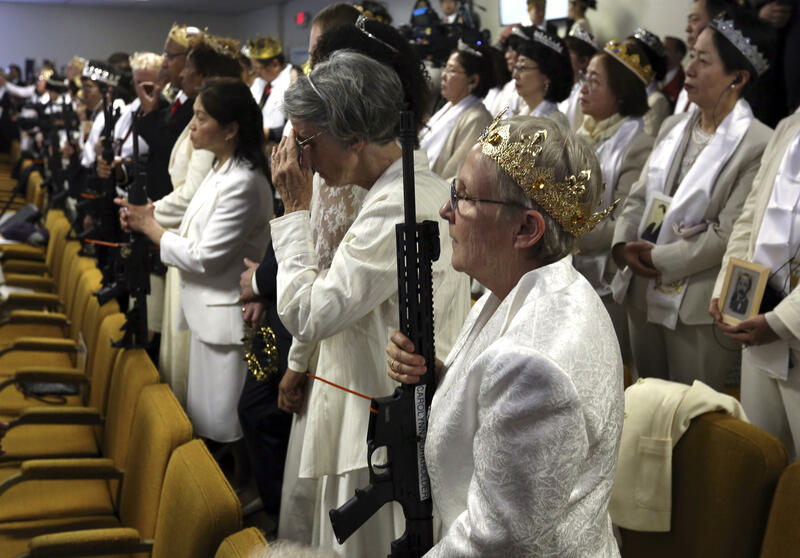 NEWFOUNDLAND, Pa. -- Hundreds of crown-wearing worshipers clutching AR-15 rifles drank holy wine and exchanged or renewed wedding vows in a commitment ceremony at a Pennsylvania church on Wednesday, prompting a nearby school to cancel classes. With state police and a smattering of protesters standing watch outside the church, brides clad in white and grooms in dark suits brought dozens of unloaded AR-15s into World Peace and Unification Sanctuary for a religious event that doubled as an advertisement for the Second Amendment. World Peace and Unification Sanctuary in Newfoundland believes the AR-15 symbolizes the "rod of iron" in the biblical book of Revelation. But Wednesday's event, coming on the heels of the high school massacre in Parkland, Florida, which killed 17, rubbed emotions raw. Authorities say the shooting suspect, Nikolas Cruz, used an AR-15 in the attack. But 41-year-old Sreymom Ouk -- who attended the ceremony with her husband, Sort Ouk, and came with their AR-15 -- said the weapon is useful for defending her family against "sickos and evil psychopaths."